Volunteering is a selfless act, and when it involves a life-threatening medical condition affecting kids, it’s a particularly inspirational commitment. This describes OneBeacon Accident’s (OBA) Steve Mueller, who’s volunteered with the Boomer Esiason Foundation (BEF) for years. BEF is a dynamic partnership of leaders in the medical and business communities who volunteer to heighten awareness, education and quality of life for those affected by cystic fibrosis, while providing financial support to research aimed at finding a cure. Steve’s commitment has been contagious, catching on among his OBA teammates and other friends and colleagues in the industry. His efforts now include serving on BEF’s Board of Directors, and more recently, recognition as the 2014 Timothy M. O’Brien Award recipient presented at BEF’s annual gala fundraiser. With OBA teammates in attendance and Charitable Trust sponsorship, Steve’s success and drive exhibited through his support of BEF and throughout all other aspects of his life were honored that evening. The Timothy M. O’Brien Award was established in 2003 to honor an original BEF Board member who lost his life in the September 11 terrorist attacks. We congratulate Steve for all he does to help those struggling with cystic fibrosis and for supporting their fight for a cure. 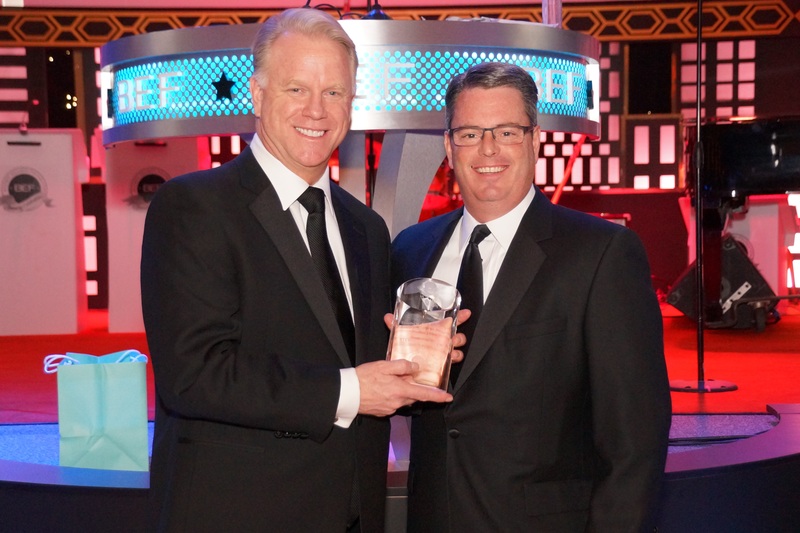 Steve is pictured below with BEF’s founder and namesake, Boomer Esiason.